An Italian archaeological mission has accidently uncovered a collection of five private rock-hewn Third Intermediate Period tombs while brushing sand from parts of King Amenhotep II’s temple, located on the northern side of the Serapaeum on Luxor's west bank. Each tomb includes a deep shaft leading to a burial chamber containing a wooden painted sarcophagus. The sarcophagi are decorated with funerary and religious scenes painted in black and red and house skeletons of the deceased. 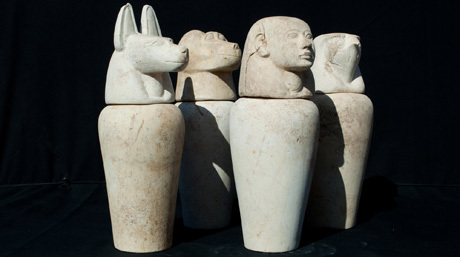 Mansour Boreik, supervisor of Luxor antiquities, said that 12 very well preserved mud brick and sandstone Canopic jars were also unearthed. These jars, explained Boreik, were used by ancient Egyptians to store and preserve the deceased's bodily organs for use in the afterlife. They are medium-sized containers covered with lids depicting the heads of the four sons of Horus: Imsety, with a human head to protect the liver; Hapi, with a baboon head for the lungs; Duamutef, with a jackal head for the stomach; and Qebehsenuef, with a falcon head for the Intestines. The jars are now housed in the area storehouse for restoration and study. "It's a very important discovery that highlights the importance of King Amenhotep II's temple years after the pharaoh's death," said Minister of State for Antiquities Mohamed Ibrahim. He told Ahram Online that King Amenhotep II also had a tomb in the Valley of the Kings that housed a collection of royal mummies discovered in 1882. King Amenhotep II was the seventh pharaoh of the 18th Dynasty. He inherited a vast kingdom following the death of his father, Thutmose III, and held it by means of several military campaigns in Syria. His reign witnessed the end of hostilities between Egypt and Mitanni, the two major kingdoms struggling for power in Syria. this is fascinating! Can't wait to hear and learn more about this important discovery! Thanks so much sharing!